All you have to do is tap the Call button in your Grab app as usual and the call will be done over the internet. Update your Grab app and give it a try today! Drivers won’t be able to see your contact details (and you won’t see theirs) when you make or receive a call on Grab. In case of poor internet connection, you’ll be prompted to make a phone call using a set of random digits* instead of your real phone number. *This is available in selected regions only. When your driver calls you, you’ll see an incoming call screen with your driver’s name. 1. Why am I not seeing the regular phone number while calling? 2. Why can’t I make calls over the internet? You and your driver must be on the latest version of Grab/Grab Driver app for this feature to work. 3. What happens when I am in a bad network area? If your internet is activated, your call will still be done over the internet. You will have the option to turn off your internet connection so you can make a call via your regular phone line (using your mobile minutes). 4. What happens when my internet is not active? You will be able to call via your regular phone line. 5. Can I call via internet post ride completion for any Lost & Found issue? 6. When I am travelling abroad, will I incur extra charges for the internet call? Your standard data roaming charges will apply. Please check with your telco service provider for data charges. 7. What happens when the call gets disconnected due to internet becoming inactive? Your call will end. You can call again by tapping the Call button on the booking page. You should be connected via a regular phone call (call charges apply). 8. 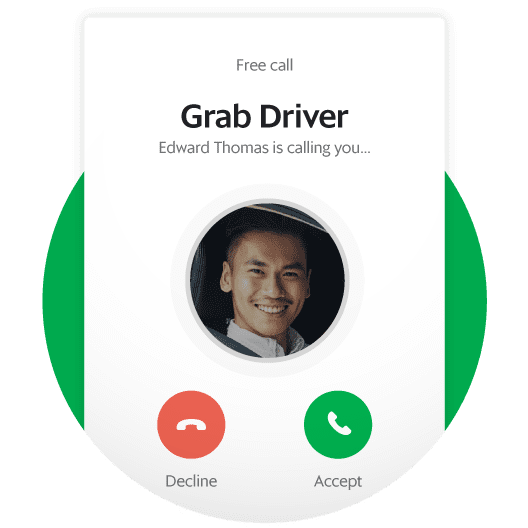 Can I use the internet call for all Grab services? 9. I am seeing ‘free call’ on the screen when I place a call. But, I was charged for my data. Why? ‘Free call’ is being used to signify that you will not incur any charges on your phone call. However, regular data charges would apply. 10. I don’t want to use my data for calling. How can I switch back to the regular phone call? We apologise for the inconvenience, however, we do not have the capability to allow switching back at this time. We recommend you to use this feature as it helps protect your phone number. 11. How do we prevent data over-use?